Buy and Hold Investing - What Does It Mean? 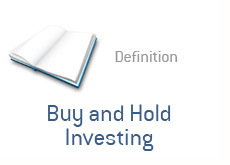 What is the definition of "buy and hold investing"? In a "buy and hold" investment strategy, investors look to purchase and hold assets (for the purpose of this article, we'll say stocks) for a long period of time. "Buy and hold investing", which was made popular by Warren Buffett, involves seeking out quality companies that an investor can feel comfortable about holding over the long run. Not only that, but an investor would seek out a well-run company that would (hopefully) provide market-beating returns over the long-term. The advantages of "buy and hold" investing? 1. Less worries about the day-to-day fluctuations of the market. 3. Fairly simple method of investing. Investors are encouraged to constantly re-evaluate their positions when engaging in a "buy and hold" strategy, but many fail to do so. This leads to many investors "marrying" stocks and refusing to sell them, even when they clearly should (eg GM). Some have speculated that "buy and hold" investing may be dead given the recent decline in the markets. You believe that Google is set to be a dominant (and very profitable) company over the next 20-30 years. You decide that you will purchase a long-term position in the company, and use any short-term weakness to continue to add to your position. This is "buy and hold" investing. How Will People Invest In The Future?